Today's bake is another variation on the multi-grain sourdough breads I have been baking for the past few years. 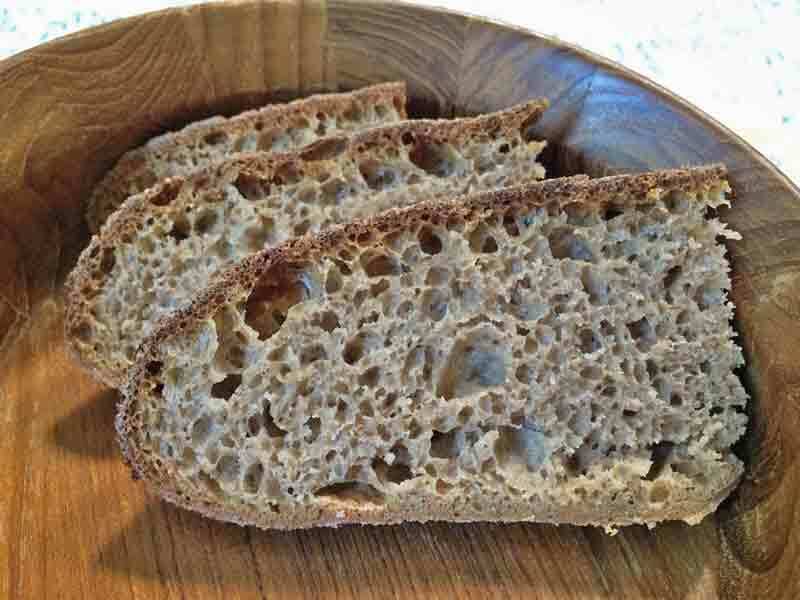 This bread differs from the one posted August 8 (See: Multi-grain sourdough bread made with home-milled flours August 8, 2018 ) in only two ways: I increased the Spelt flour from 10% to 20% and decreased the Rye flour from 17.5% to 7.5%. I also used a high-protein bread flour for all the “white” wheat flour. The increase in dough strength during bulk fermentation was noticeable, but the dough was still quite slack and sticky. Dissolve the starter in the water. Add the flours and mix thoroughly. Transfer to a clean container, cover and ferment until ripe (6 hours for me.) If you don't use it immediately, it can be kept in the refrigerator for up to 3 days. Mix the flours with the water to a shaggy mass. 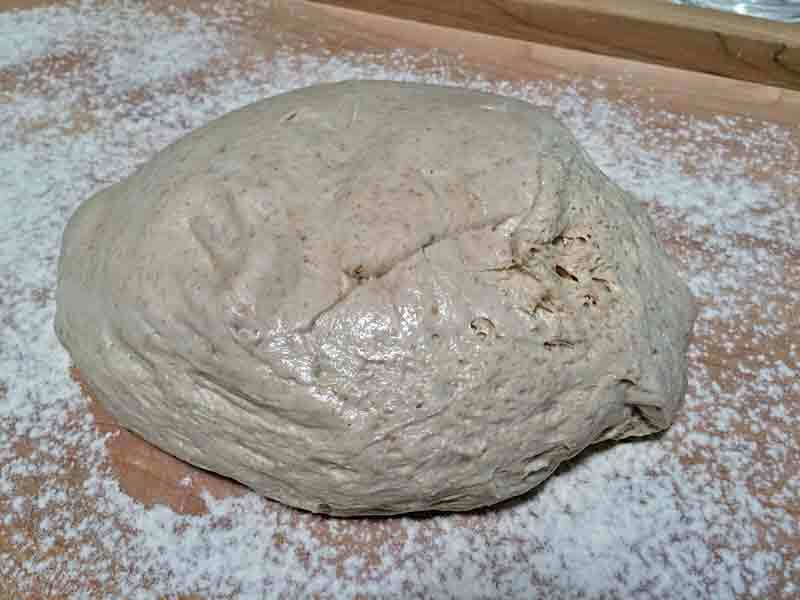 Sprinkle the salt over the dough surface and add the levain in 4 to 6 portions. Transfer the dough to a lightly oiled, clean bowl large enough to accommodate doubling in volume. Cover well. 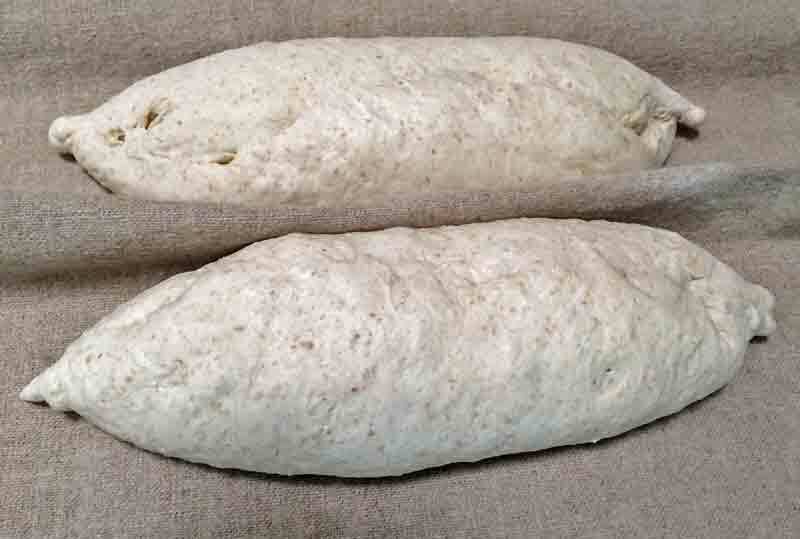 Ferment at 80ºF for 2.5 – 3.5 hours with stretch and folds every 30 minutes for the first 2 hours. The dough should have nearly doubled in volume and be quite puffy. Transfer the dough to a well-floured board. It will be quite sticky and needs to be handled quickly with well-floured hands, helped by a bench knife. Divide the dough as desired and pre-shape in rounds. Cover with a cloth and let rest for 20-30 minutes. Shape as boules or bâtards and place in floured bannetons. Place these in food-grade plastic bags sealed with ties and let proof for 30-60 minutes at room temperature. Refrigerate 8 hours or up to 36 hours at 40ºF. The next day, pre-heat oven. Let the loaves sit at room temperature while the oven pre-heats. You can bake on a baking stone ,with steam for the first part of the bake, or in Dutch ovens, as you prefer. The oven temperature and length of the bake will depend on which of these methods you choose and on the weight and shape of your loaves, as well as on how dark you prefer your crust. When done, the loaves should sound hollow when thumped on their bottoms. The internal temperature should be at least 105ºF. Let the loves cool completely on a rack for 1-2 hours before slicing. 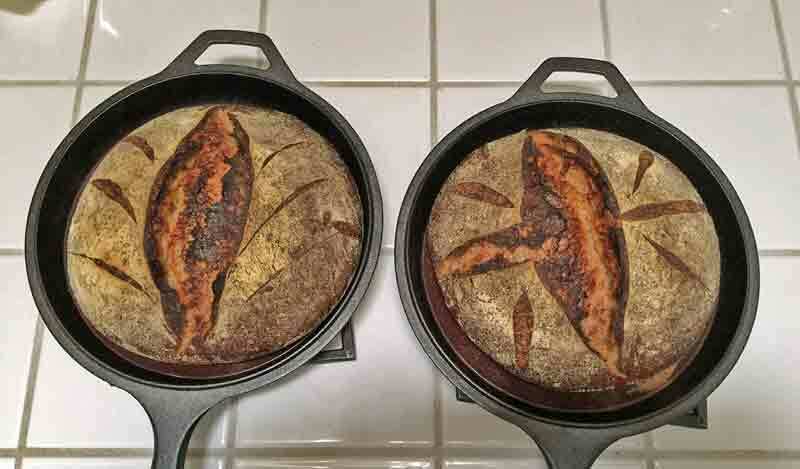 These loaves were baked in Cast Iron Dutch ovens at 475ºF for 30 minutes covered, then 20 minutes un-covered. Oh, my! This is the best of the current series. The crust is crunchy. 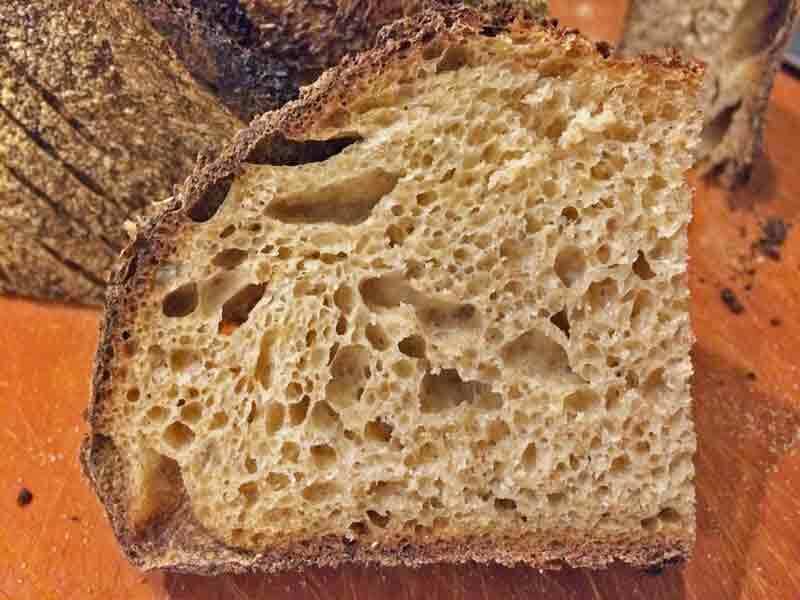 The crumb is tender but slightly chewy. 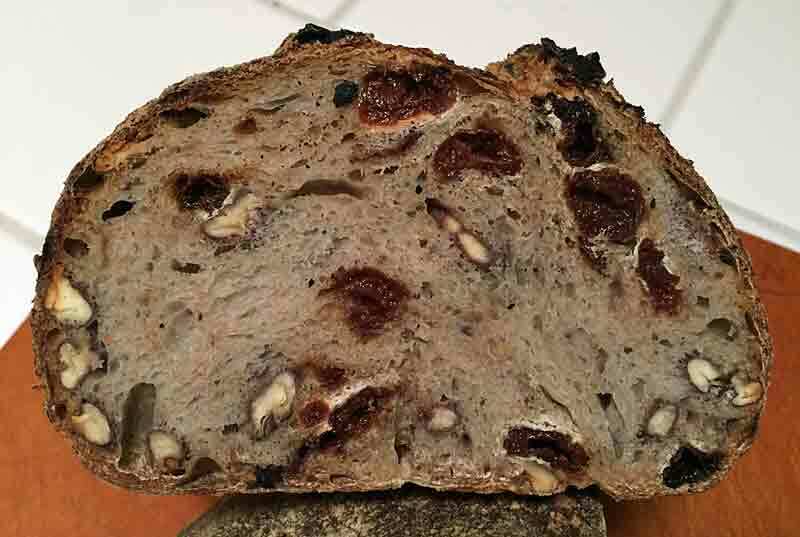 As expected, the crumb is more open than that of the breads with more rye. 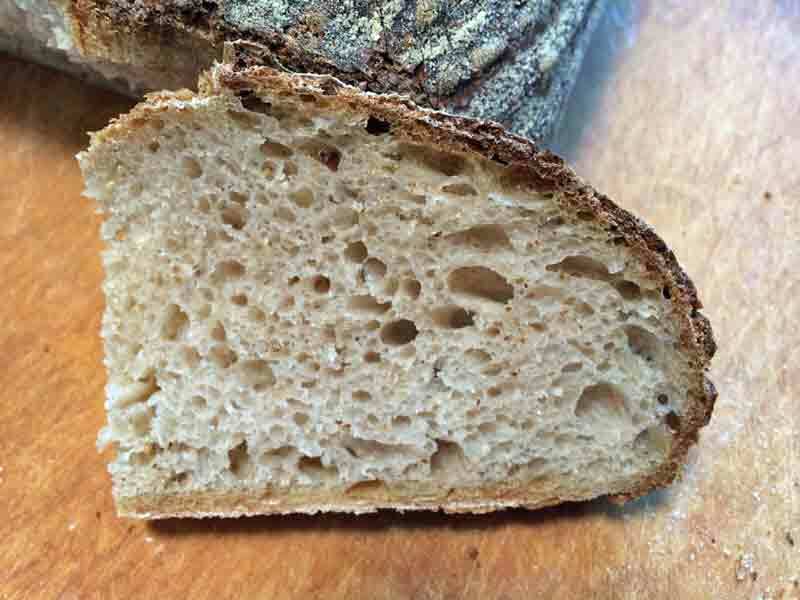 I suspect the higher gluten flour contributed to the good oven spring and open crumb as well. The flavor is assertively sour with a nice balance, leaning toward the acetic acid side. It is not so assertive that is swamps the nice, mellow wheaty flavors however. This one is a keeper. Today's bake is another variation on the multi-grain sourdough breads I have been baking for the past few years. 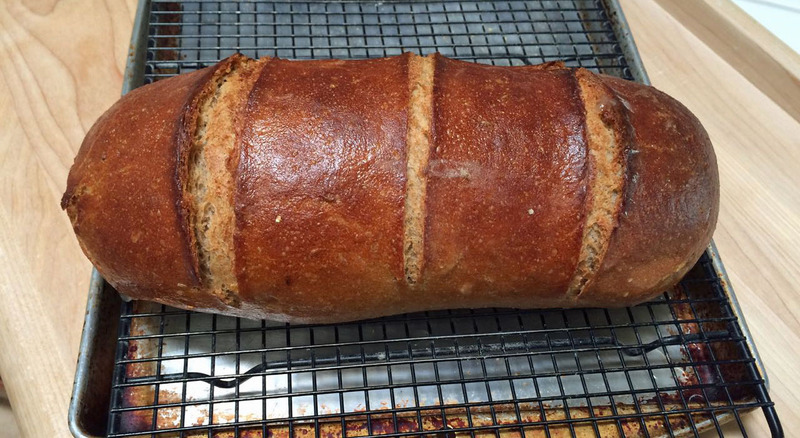 This one has a bit more whole grain flour – 40% versus 30%. Some fresh-milled spelt was substituted for some AP flour. The whole grain flours were milled in a MockMill 100, just before mixing. Because of the higher percentage whole grain flour, I also bumped the hydration up from 78 to 83%. The next day, pre-heat the oven. Let the loaves sit at room temperature while the oven pre-heats. You can bake on a baking stone, with steam for the first part of the bake, or in Dutch ovens, as you prefer. The oven temperature and length of the bake will depend on which of these methods you choose and on the weight and shape of your loaves, as well as on how dark you prefer your crust. When done, the loaves should sound hollow when thumped on their bottoms. The internal temperature should be at least 105ºF. I tasted this bread about 6 hours after baking. It had a wonderful aroma. The crust was crunchy. 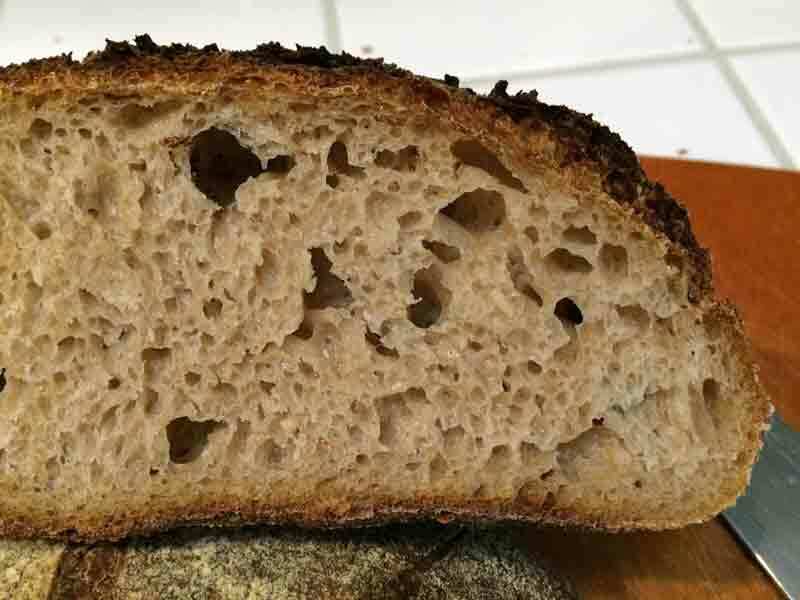 The crumb was nicely aerated. It had a cool mouth feel. It was mildly chewy. It tasted moderately sour with a complex flavor and some grassiness. I expect it to mellow considerably by tomorrow. Addendum 8/9/2018: As expected, after a day, the flavors have melded. It was good freshly cooled. It is significantly better a day later. In fact, it's pretty wonderful. I think the 40% whole grain mix is a "sweet spot." I'm going to be playing with the proportions of the different grains. My expectation is they will all be delicious. It's been a while since I have blogged here, but I have been baking. In the past couple weeks, I have actually baked some new stuff that I think is worth sharing. 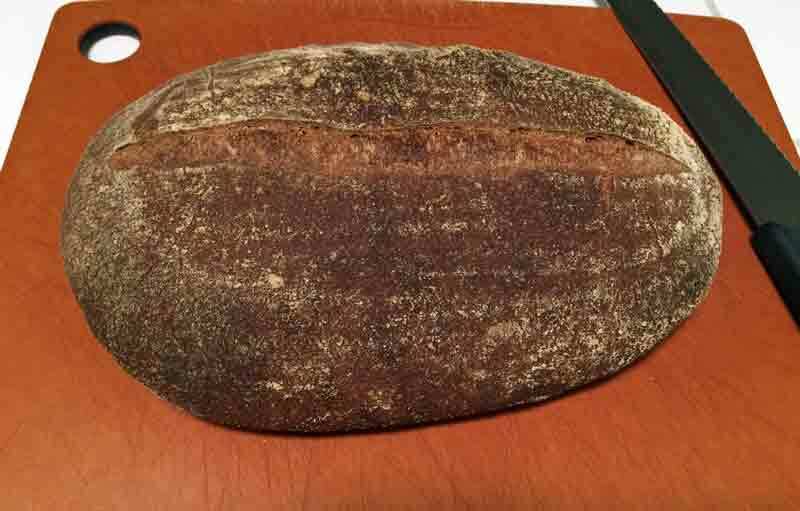 At the end of last month, I had made a 90% rye bread. I had rye sour left over, and I hadn't made Jewish Sour Rye for a while, so I did. I think they came out well. I have been sharing some loaves with neighbors and with a committee I am on that meets weekly. The loaves I keep for my wife and myself may not get completely consumed before they get a bit dry. 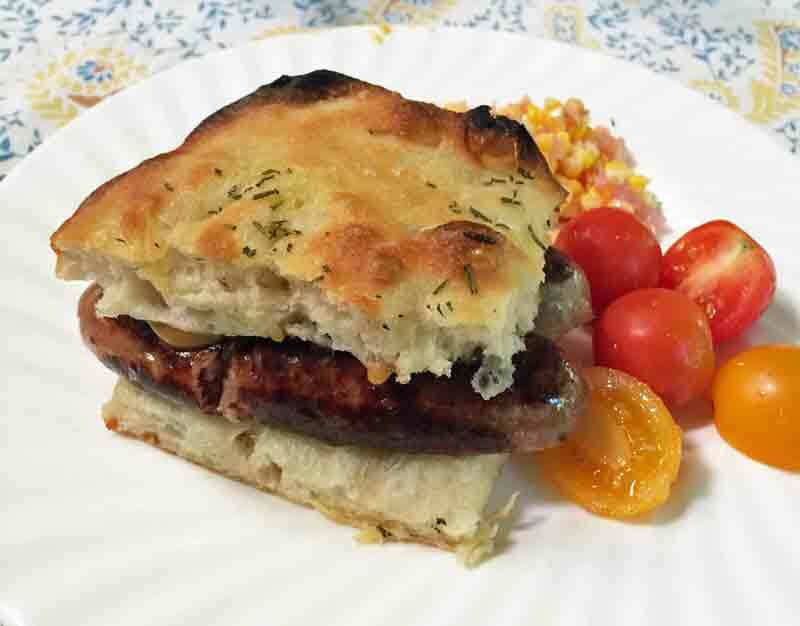 We have a number of favorite uses for dry bread. 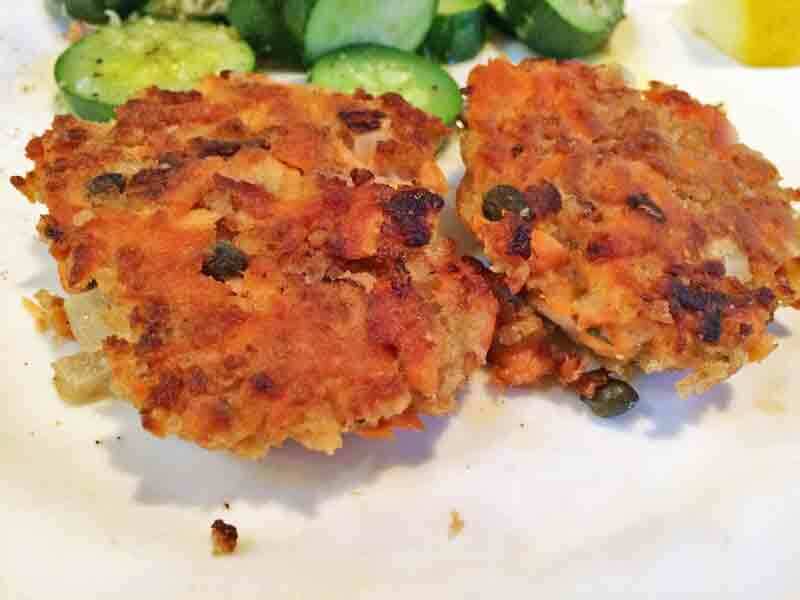 One of them is Salmon Cakes that my wife makes. They are super-delish, both hot out of the pan and cold out of the fridge the next day. I have been wanting to make pizza for weeks, but it just wasn't happening. One morning, I decided I had to "just do it." 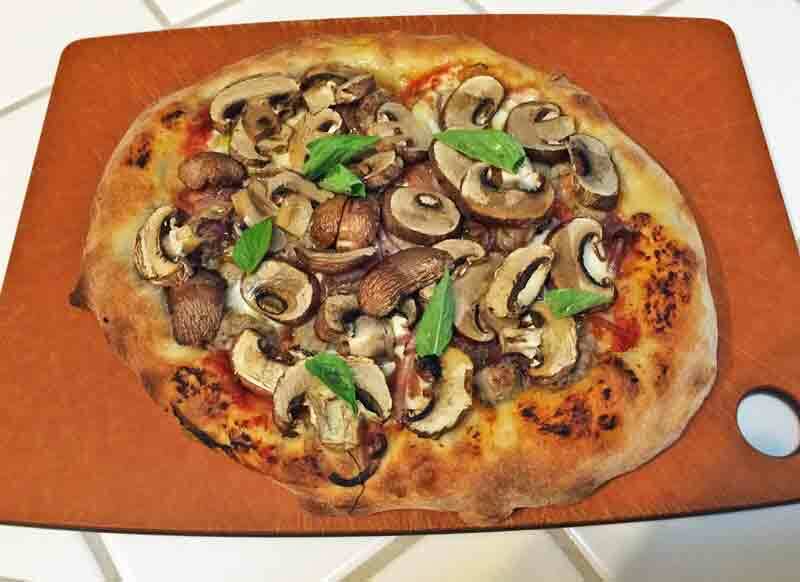 I had been making sourdough pizza crust with varying results for the past few years. This time, I decided to go in somewhat the opposite direction. I made the dough using Ken Forkish's "Same Day" pizza dough from FWSY. 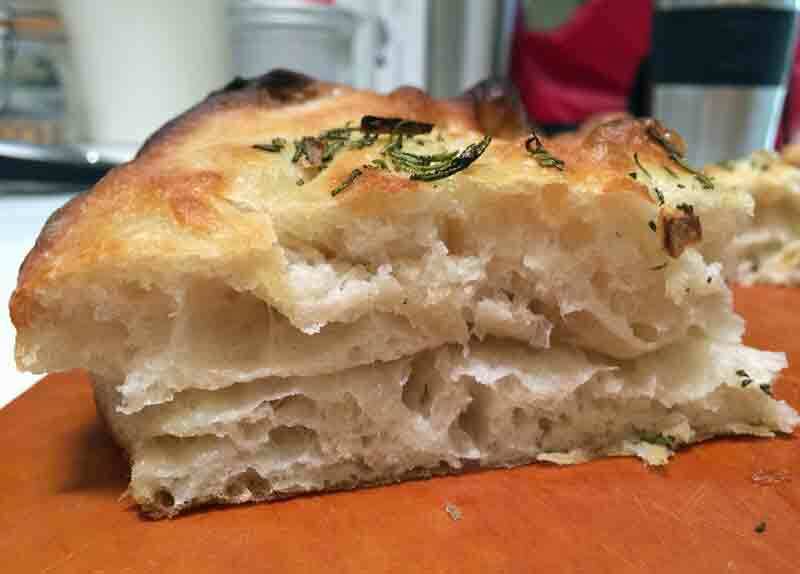 I used 25% Caputo 00 and 75% "Bread flour." Okay ... I am passionate about sourdough baking, but, I must say, this made one of the best pizzas I've had not made in a wood-fired oven. The toppings were our current favorite combination: Tomato sauce with garlic and oregano, mozzarella, caramelized red onions finished with balsamic vinegar, Italian sausage and mushrooms. Parmesan, fresh basil leaves, pepper flakes and EVOO after baking. I made enough dough for 4 pizzas. My wife and I ate one. Another was frozen for future lunches. The other two dough balls sat in the fridge for a couple day, just growing and growing. 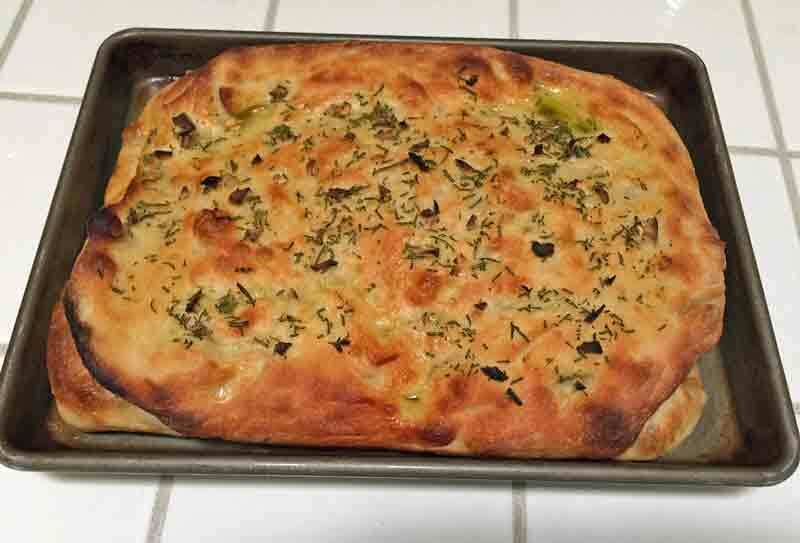 So, I made a focaccia with fresh rosemary and garlic and coarse sea salt. It was awfully good for white bread and made a nice sandwich with Adell's smoked chicken/apple sausage. Although I have been home milling at least some of the flour in almost all of my baking for the past few months, I had yet to make a bread with the majority of the flour fresh-milled until today. Today's baked was, again, from FWSY - a 75% whole wheat levain. Now, many of the FWSY breads I like call for spiking with instant yeast. I typically leave it out. For this bake, the formula called for just a tiny bit of instant yeast, and I thought "why not?" Well, even with no proofing except at 40ºF in the fridge, the loaves over-proofed. So oven spring and bloom were modest. 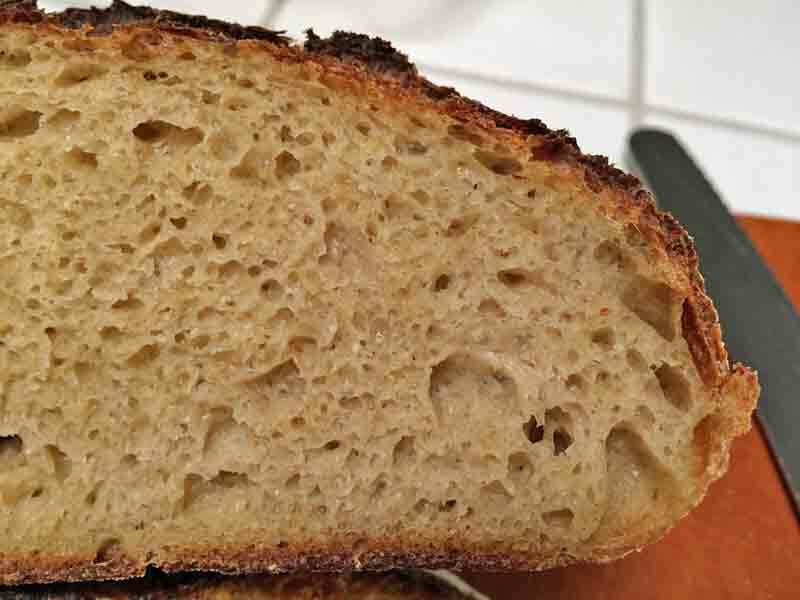 The crumb structure remained good, and the flavor is lovely. I'll be making this bread again, but leave out the IY next time for sure! That's what I've been baking for the past few days. We're planning to spend most of the rest of July - the hottest month of the year where we live - in cooler climes. (Bach Festival in Carmel and Giant's games in San Francisco.) Hope you all are coping well with the weather where you live! Today's bake 3-24-18: Nothing new. Just more pretty breads. A couple more of my current favorite multi-grain sourdough breads. These were baked in cast iron Dutch ovens. Read more about Today's bake 3-24-18: Nothing new. Just more pretty breads. 60% Kamut Sourdough Bread from "Tartine Book No. 3"
This is my first venture into baking with Kamut. It won't be my last. Kamut is a copyrighted name for Khorasan wheat which is an "ancient grain" - one of the ancestors of modern durum wheat. Like durum, it is a large berry that is yellowish in color and, when used in high percentages, gives a yellowish color to the bread's crumb. 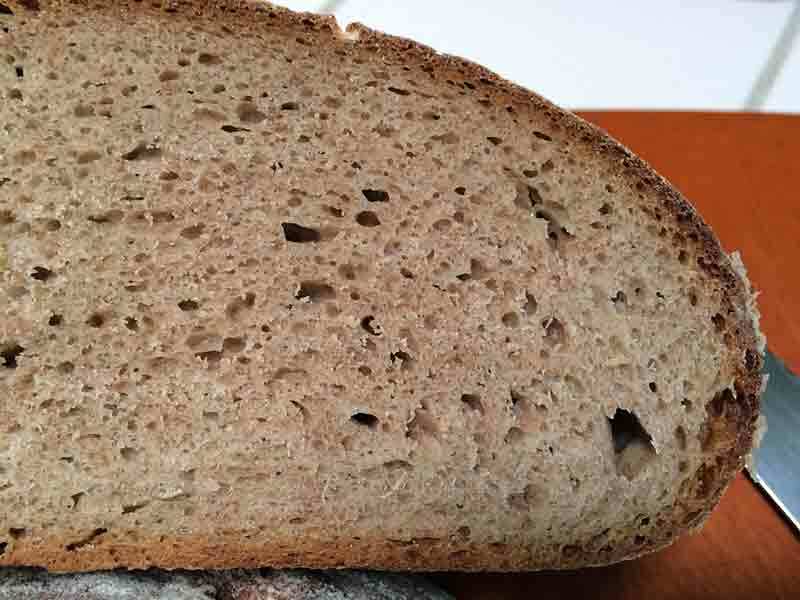 It is claimed that individuals who cannot tolerate the commonly available modern hybrid wheat can tolerate breads made with ancient grains (eikorn, emmer, khorasan). Kamut is very high in protein, but not in gluten. It absorbs a lot of water, particularly when used as a whole grain flour. 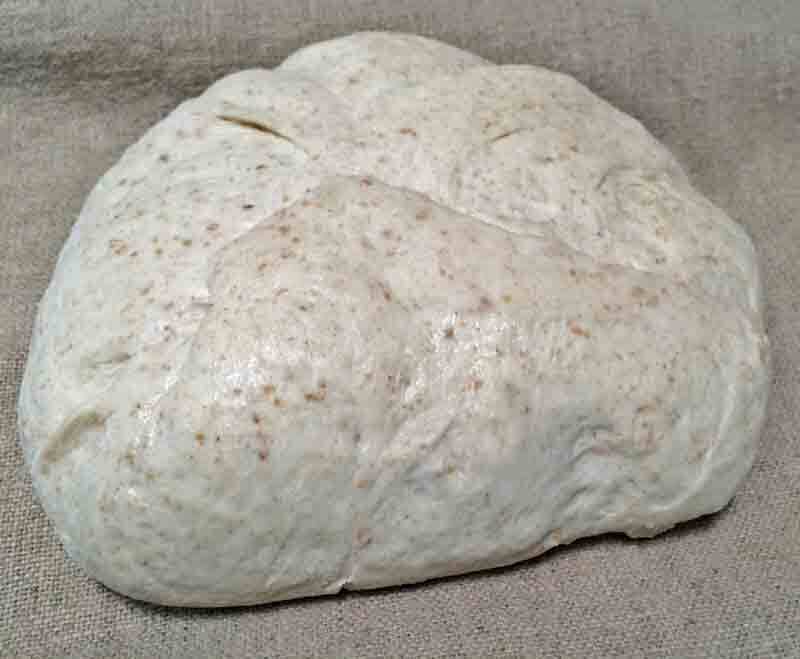 The resulting dough benefits from high hydration and from a longer than normal autolyse. This bread is said to be 85% hydration. In fact, because Chad Robertson does not account for the water in his liquid starter when calculating baker's percentages, the hydration is a bit higher. This dough is 60% whole grain Kamut. (I used freshly milled flour.) It also calls for another 20% high-extraction flour. (I used Central Milling's T85 Organic flour). Yet, the dough was delightful to handle. It was tacky but not sticky and very extensible. 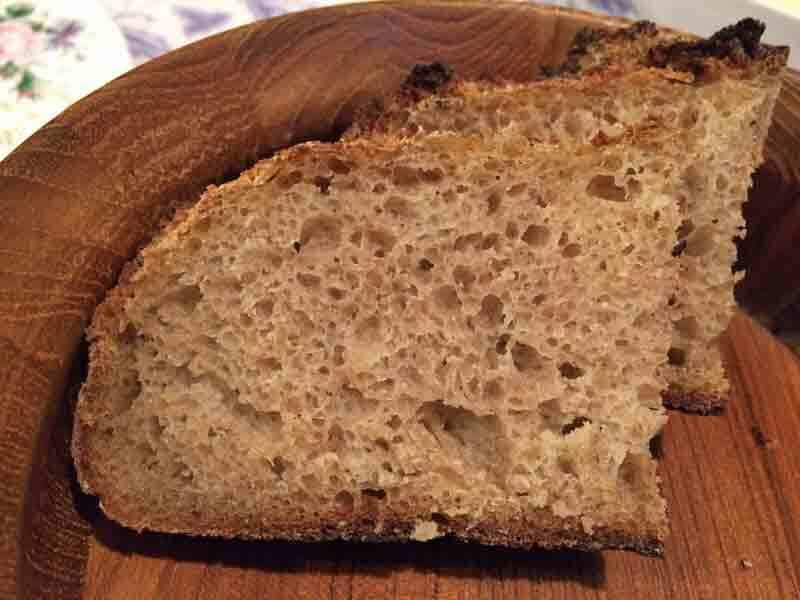 The loaf's crumb is airy, light, cool and tender. 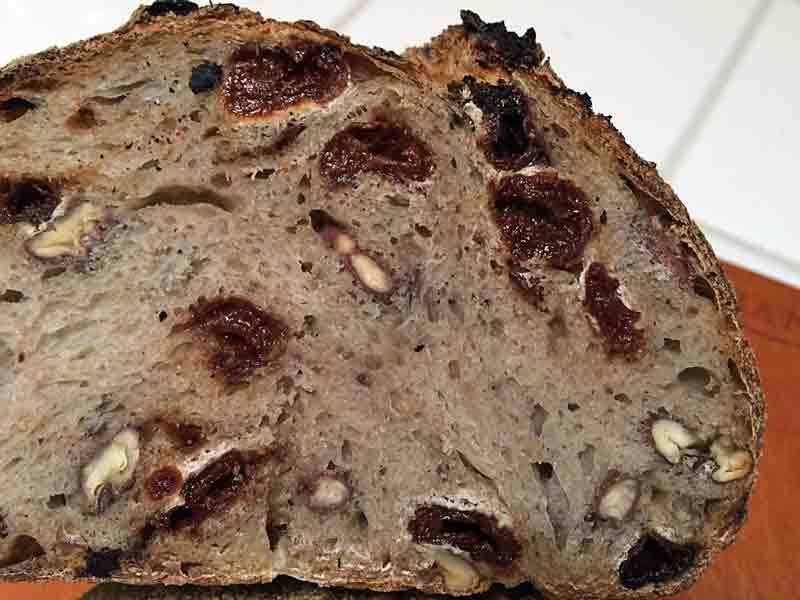 The flavor when freshly cooled was not very different from a bread made with common red hard Winter wheat, to my taste. My experience with similar breads is that their flavor evolves over the first 2 or 3 days, though. So, we'll see. 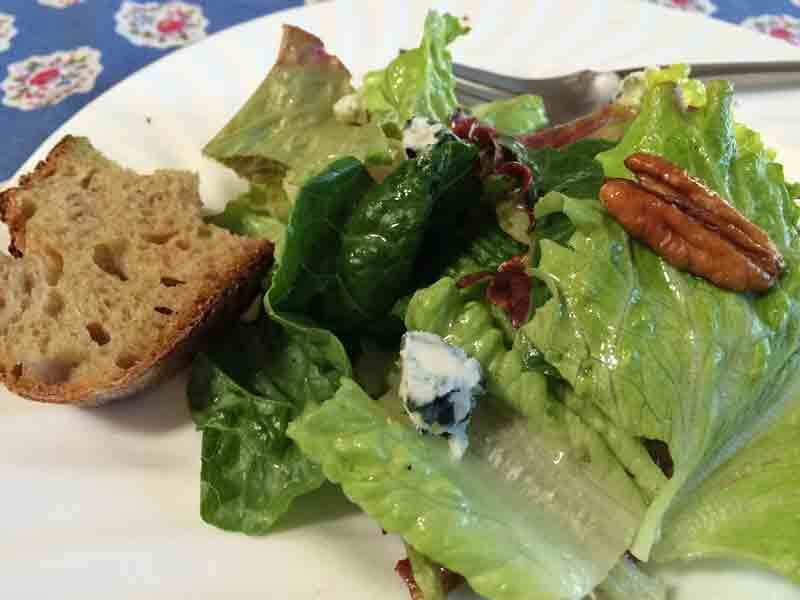 The bread was very nice for lunch with a lettuce salad with Point Reyes blue cheese, toasted pecans and comice pear. 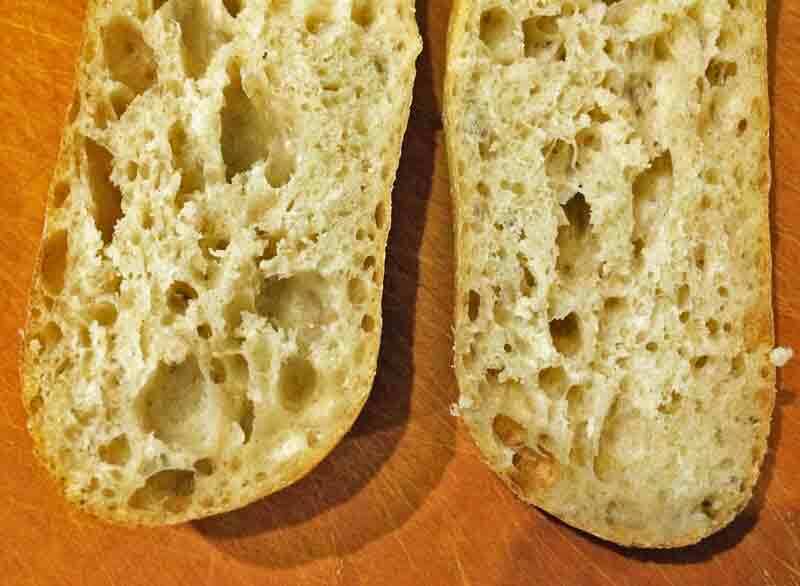 When I was working on my Pane di Altamura, I made several loaves with 100% fine durum flour and a durum-fed starter. I plan on trying a bread with 100% Kamut. I'm thinking a Greek Pan di Horiadeki. 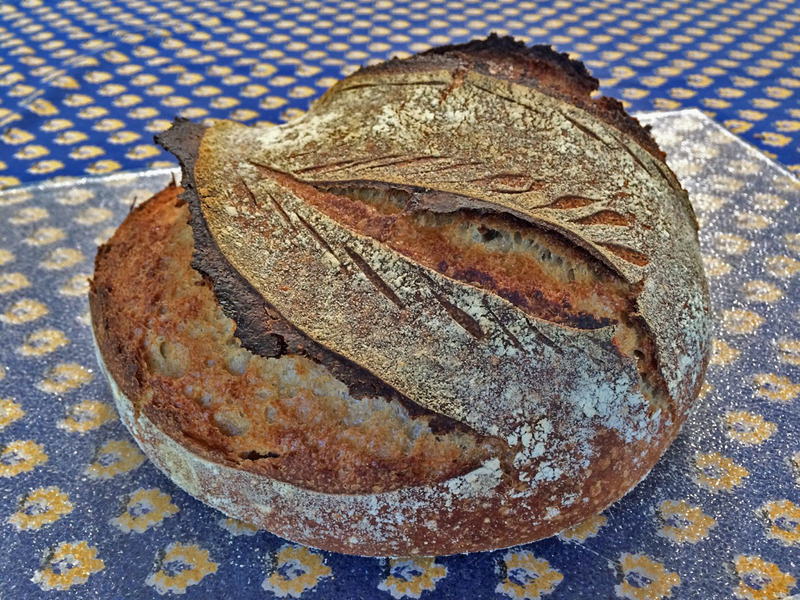 Read more about 60% Kamut Sourdough Bread from "Tartine Book No. 3"
This is one of my favorite breads. 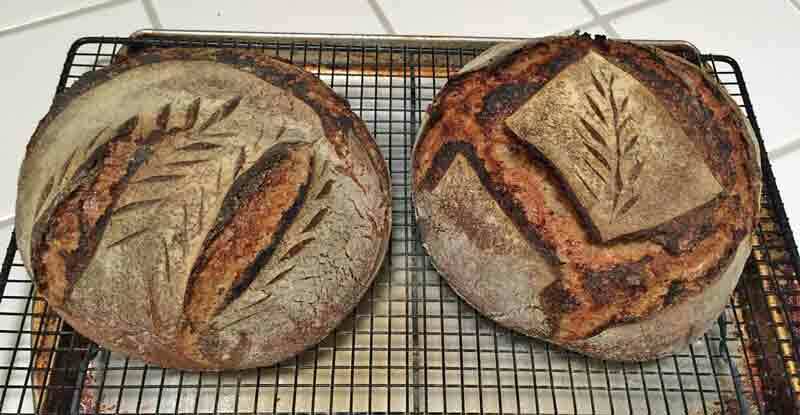 It uses the San Joaquin Sourdough method but a different flour mix and enrichment with a bit of sugar and olive oil. 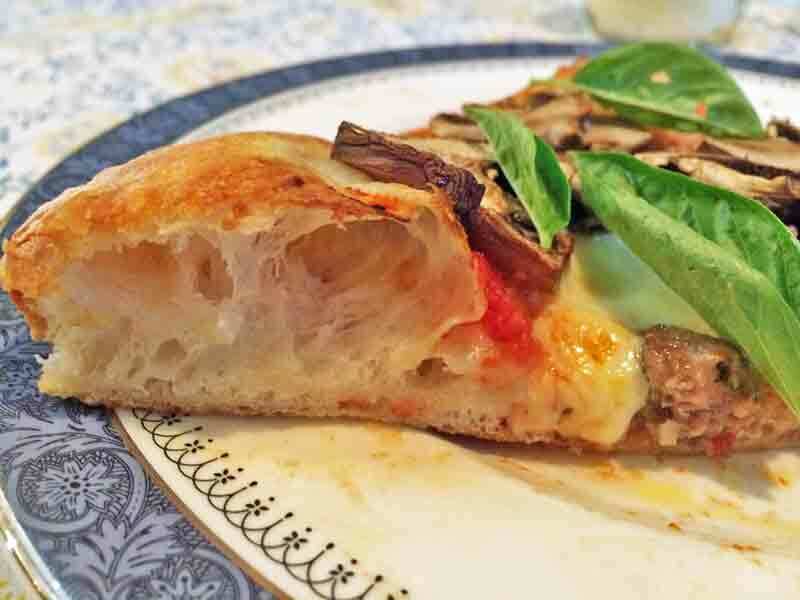 The dough is lovely to work with, and the flavor is scrumptious - both very tangy and rich. 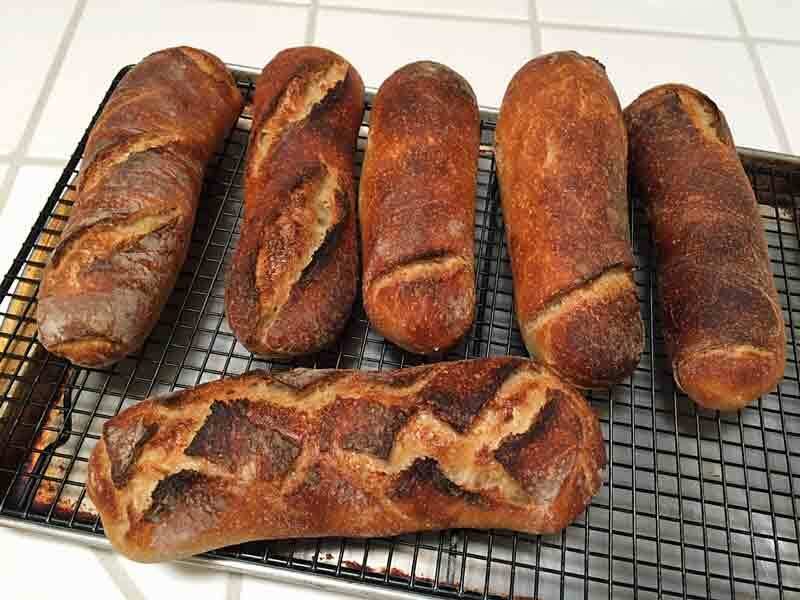 I have made a variety of breads with differing proportions of fine durum flour - from 10% to 100%. So far, I like the breads with 20-40% durum best, and this one best of all. One warning: I have fed this bread to family members and to attendees at an Italian community potluck. Every time, I have observed many individuals coming back repeatedly for "just one more slice." It does not seem truly addictive. I have not observed any abstinence syndrome ("withdrawal"), but I would exercise caution when offering it to others - reserve a loaf for yourself. Disperse the liquid starter in the water. Ferment at room temperature until expanded and bubbly (8-12 hours). If necessary, refrigerate overnight and let warm up for an hour before using. 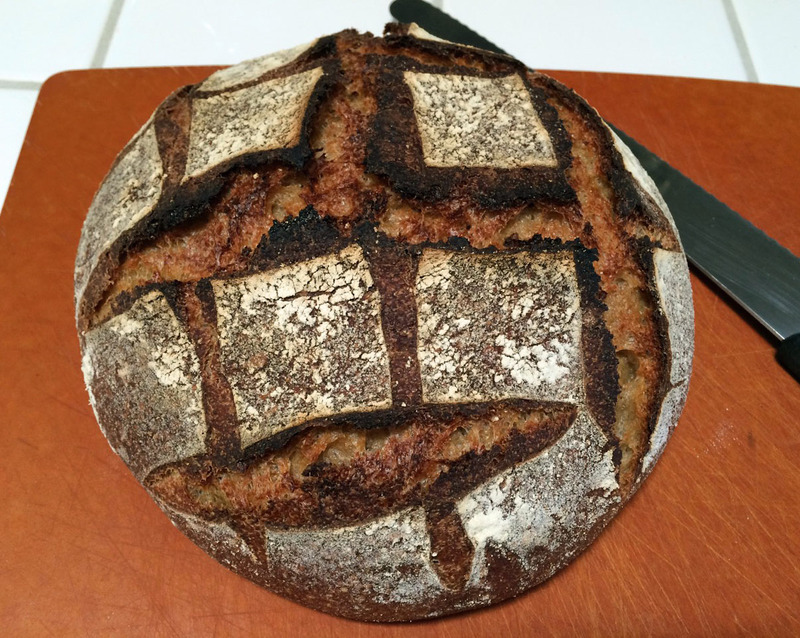 Note: You will only use 100 g of the levain for this recipe. I usually make enough for more than one use. 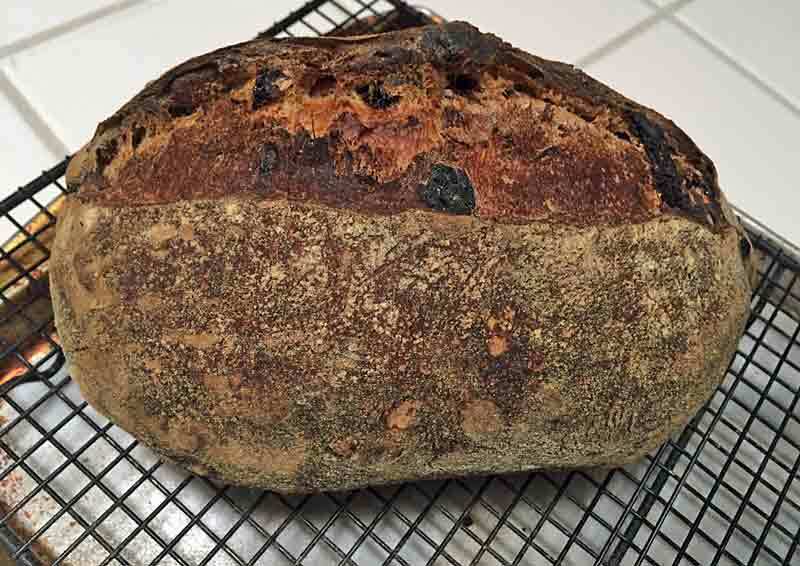 You can, of course, scale down the levain ingredients if you only want enough for this recipe. 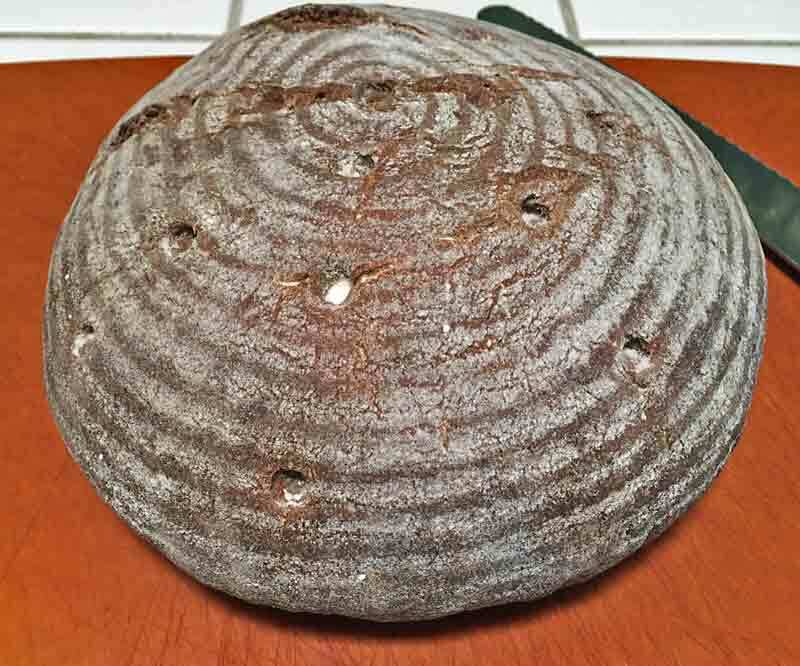 In a large bowl, disperse the levain in the water. Add the flours and sugar to the liquid and mix to a shaggy mass. Cover the bowl and let it rest for 20-60 minutes. Transfer the dough to a 2 quart lightly oiled bowl, and cover the bowl tightly. After 30 minutes, do stretch and folds in the bowl. After another 50 minutes, do a stretch and fold on a lightly floured board. Repeat after another 50 minutes. Continue bulk fermentation for another 30-90 minutes, until the dough is puffy. 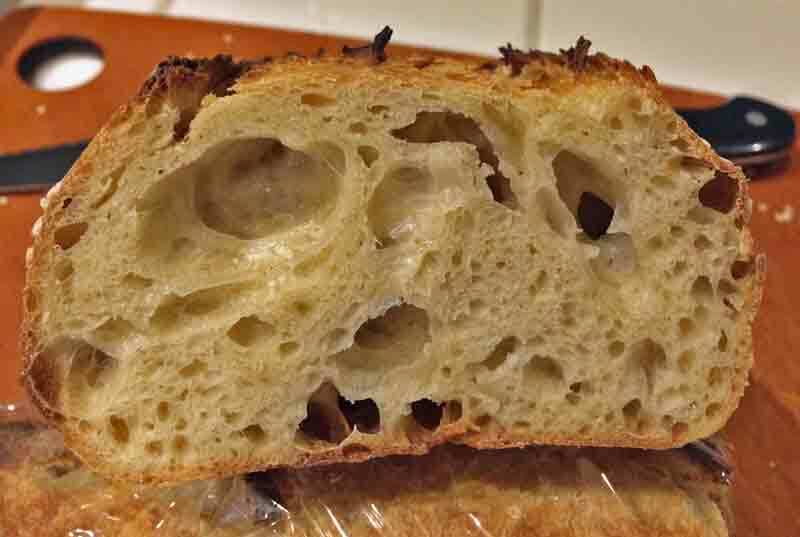 If fermented in a glass bowl, you should see lots of little bubbles throughout the dough. Volume of the dough may have increased by 50% or so. 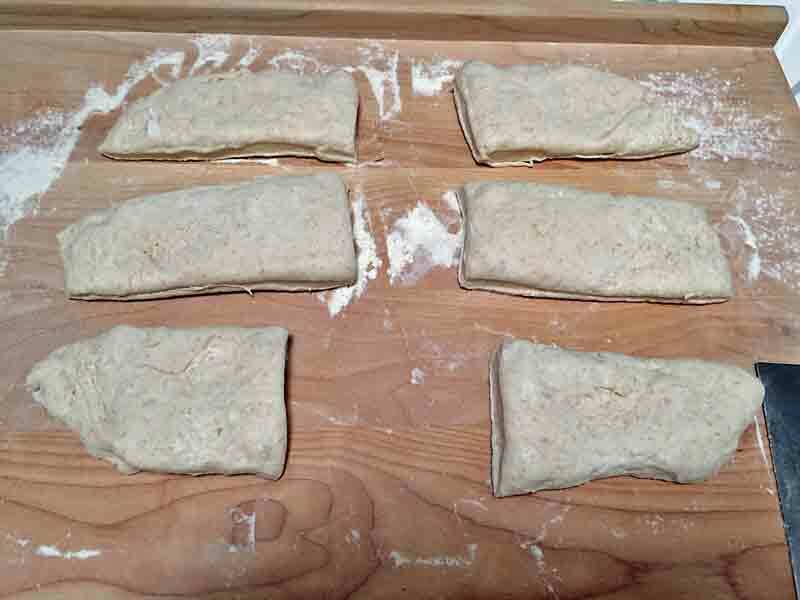 Divide the dough into 2 to 4 equal pieces and pre-shape as rounds or logs. Cover with a clean towel, baker's linen or plasti-crap and let rest for one hour. Shape as Bâtards, Demi-Baguettes or Ficelles. 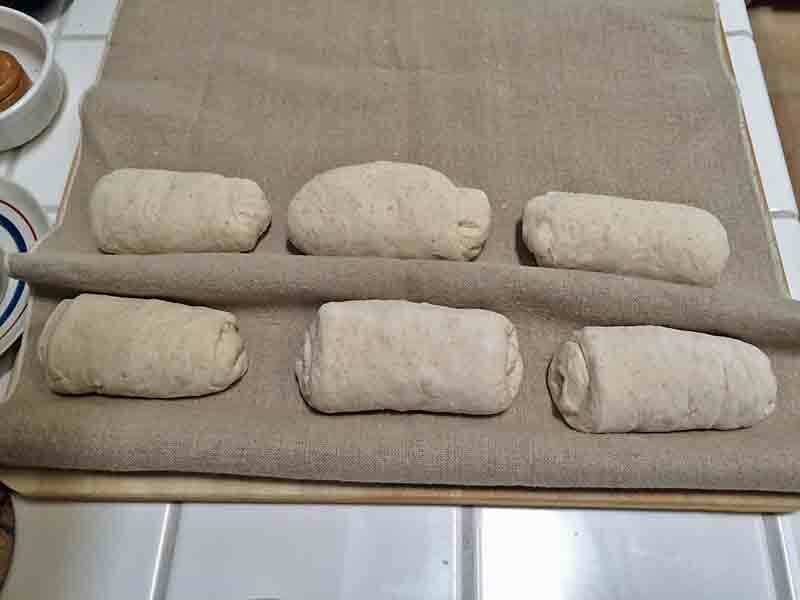 Roll the loaves on damp paper towels, then in a tray of sesame seeds. 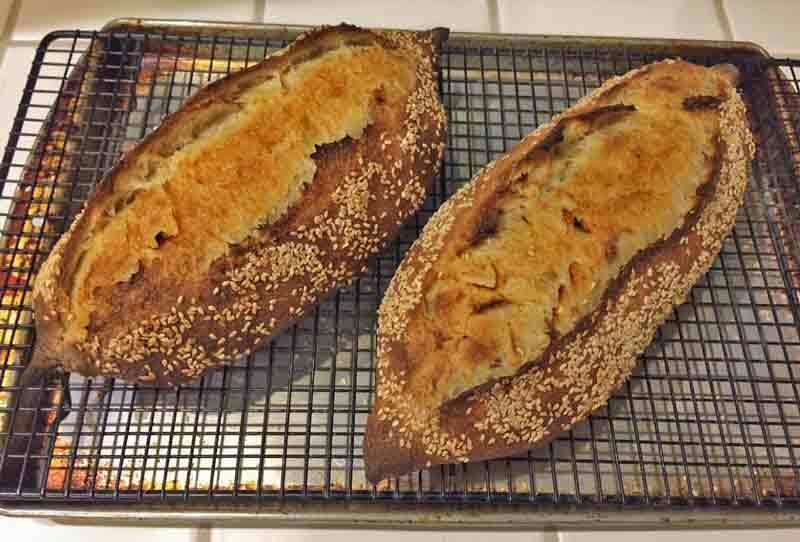 Alternatively, you can brush the loaves with water and sprinkle with sesame seeds. Proof for about 45 minutes seam-side up on parchment paper or seam-side down on linen, pleated to separate the loaves and supported at both long sides by rolled-up dish towels. Cover with a damp towel, baker's linen or plasti-crap. One hour before baking, pre-heat the oven to 480ºF with a baking stone and steaming apparatus in place. When ready to bake, uncover the loaves. Pull the parchment (or linen) from both long sides to flatten out the pleats and separate the loaves. Transfer the loaves, on the parchment, to a peel, or, if proofed on linen, transfer using a transfer peel. Seam side should now be down. Score them as baguettes or bâtards, according to their shape. Transfer them to the baking stone. Steam the oven, and turn the temperature down to 460ºF. After 12 minutes, remove the steaming apparatus. (Note: If you have a convection oven, switch to convection bake and turn the oven down to 435ºF for the remainder of the bake.) Continue baking for another 8-15 minutes or until the loaves are nicely browned and the internal temperature is at least 205ºF. Transfer the loaves to a cooling rack. Cool completely before eating. My San Joaquin Sourdough originated in Anis Bouabsa's baguettes which had won the prize for the best baguette in Paris in 2008. Bouabsa's baguettes departed from convention in utilizing a 21 hour retardation after bulk fermentation and before dividing and shaping. 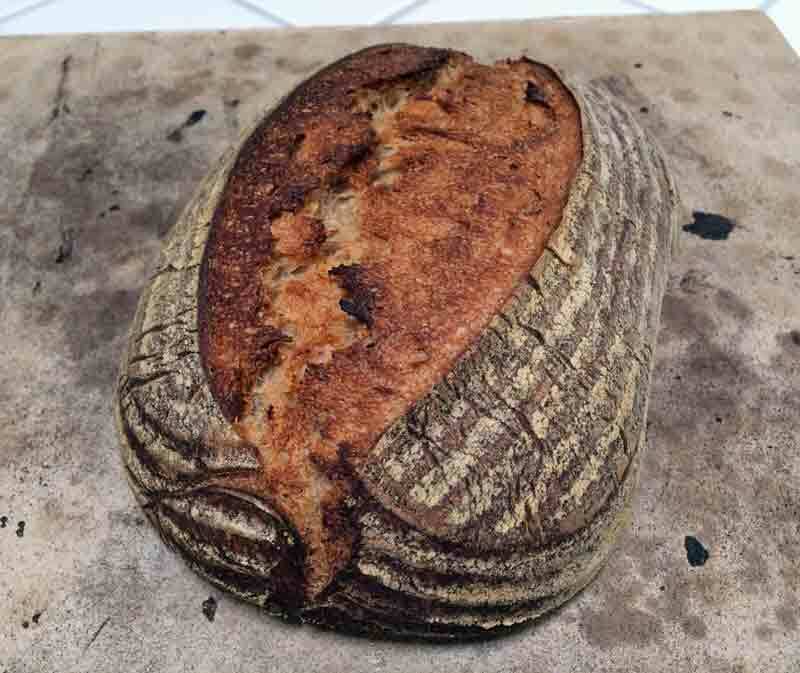 Jane Stewart (Janedo on TFL) and I initially modified Bouabsa's formula by adding a bit of rye flour and some sourdough starter for flavor. I then omitted the commercial yeast altogether and began using the modified formula to shape as bâtards. Over time, I have tweaked the formula and method in various ways, but have settled on the current one as providing the best product. I most often make my San Joaquin Sourdough as bâtards of about 490 g, but I have used the same dough for baguettes quite often. 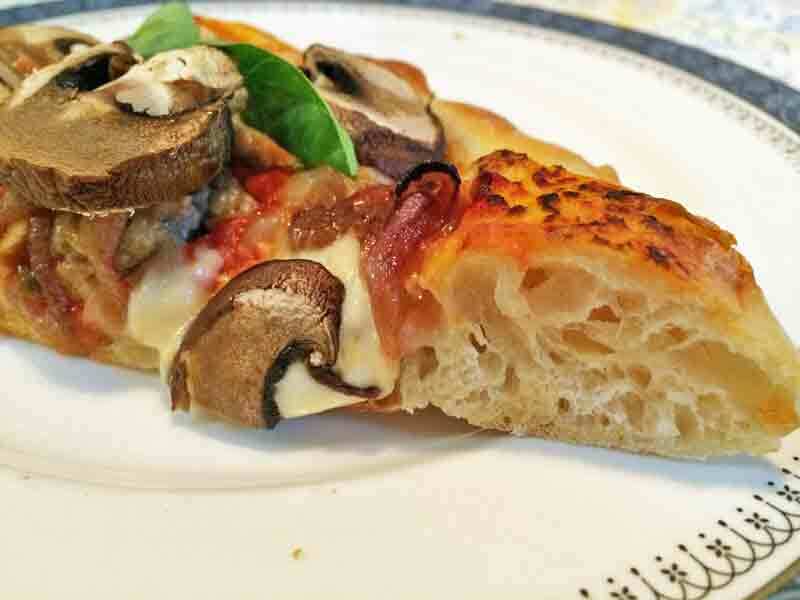 I have also modified the formula in minor ways to make an “Italian bread,” and have used it for pizza too. Professor Raymond Calvel, the renowned French baking teacher and bread scientist, was the man who taught Julia Child to bake “French Bread,” the author of “Le Gout du Pain” and the inventor of the autolyse. Shortly before his passing in 2005, Professor Calvel visited the United States and taught at the Culinary Institute of America in upstate New York. The C.I.A. and the Bread Baker's Guild of America produced a series of videos which included interviews with Professor Calvel and documentation of his baguette formula and methods. These were available for downloading and also as VHS tapes at one time. Now, they are available on youtube. They are well-worth viewing for any serious baker. On one of the tapes, almost as an aside, the narrator said Professor Calvel's personal favorite bread was what he called “Pain Rustique.” He made this with baguette dough, but, rather than shaping it in the traditional manner, the dough is simply cut into rectangular pieces with a bench knife, proofed and baked. 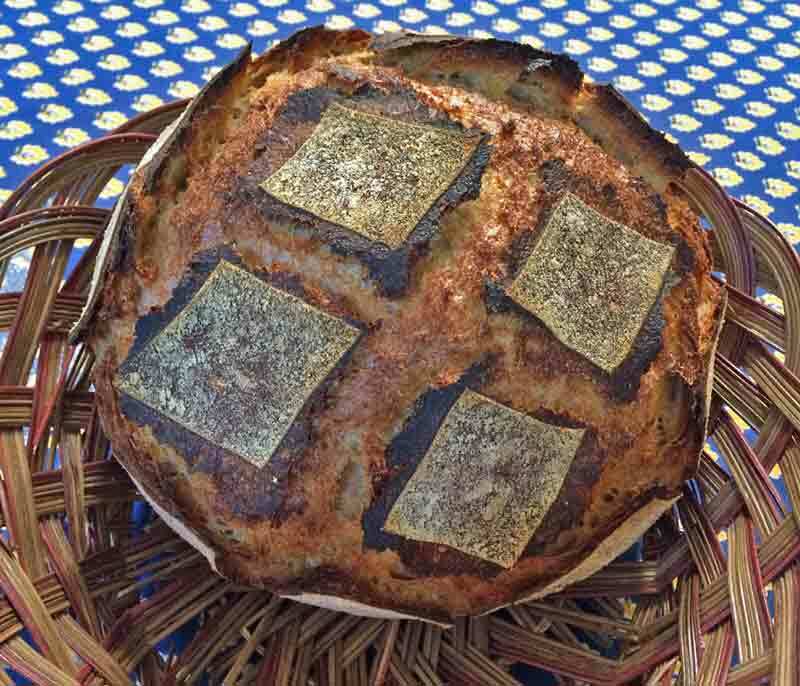 I made this bread once a number of years ago, and it was very nice. 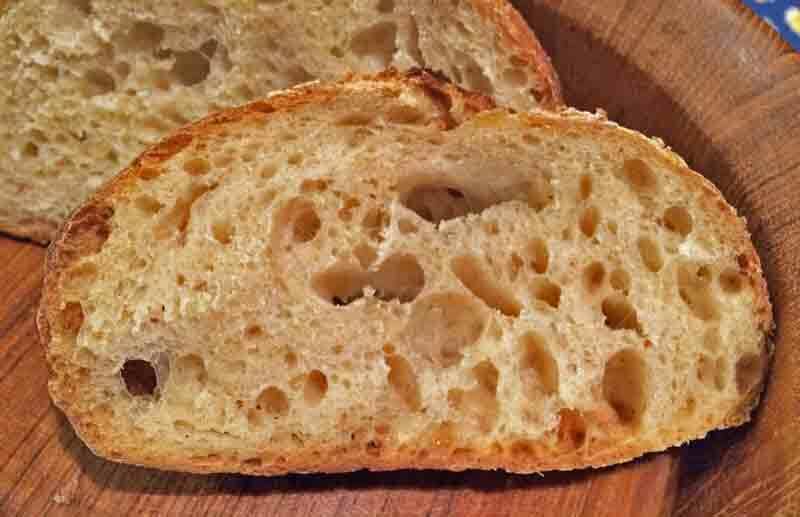 It was similar to ciabatta in that it was very puffy with large air pockets. 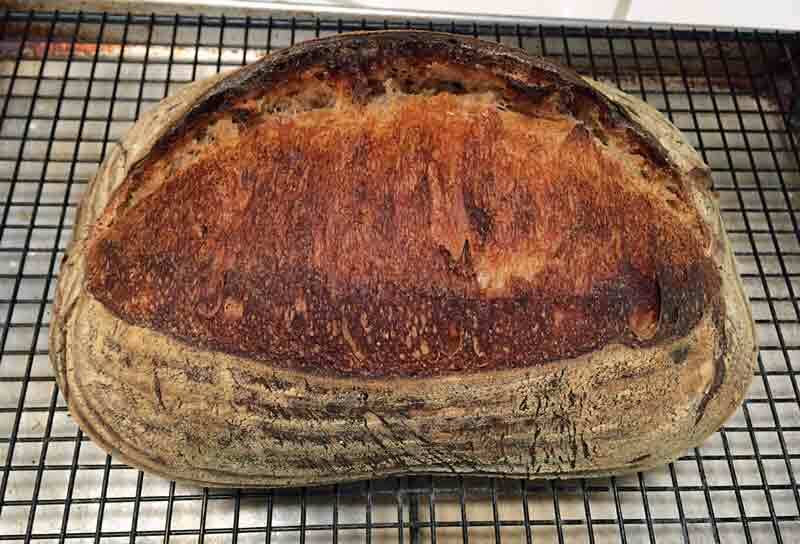 Today, I made a variation on pain rustique, using San Joaquin Sourdough dough and methods, except for the shaping. 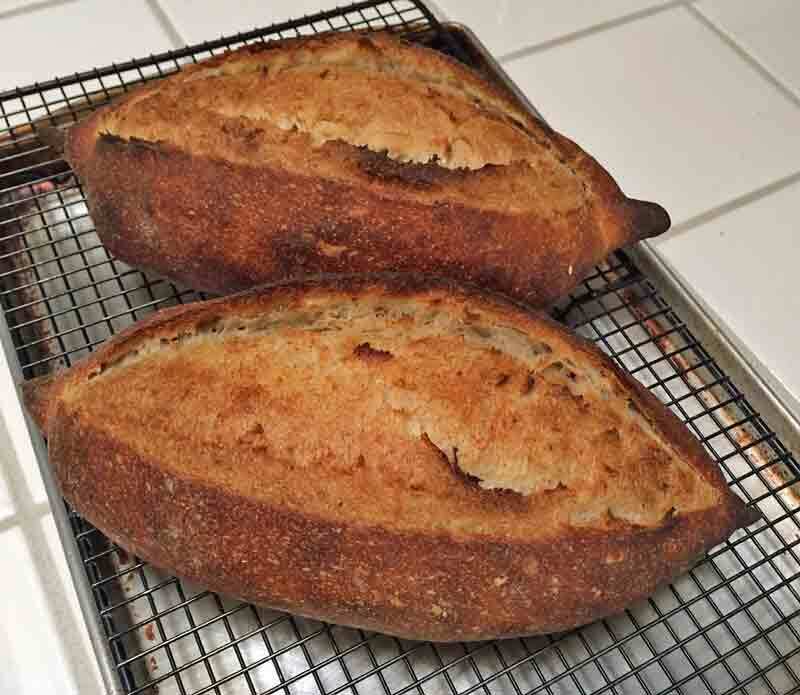 Note: The formula used for these pains rustique was actually only 72% hydration. Based on my results, I would increase the hydration to 76% hydration (as in the formula below) or even higher for my next bake of this bread. 1. Mix the levain by dissolving the liquid starter in the water, then add the flours and mix well. 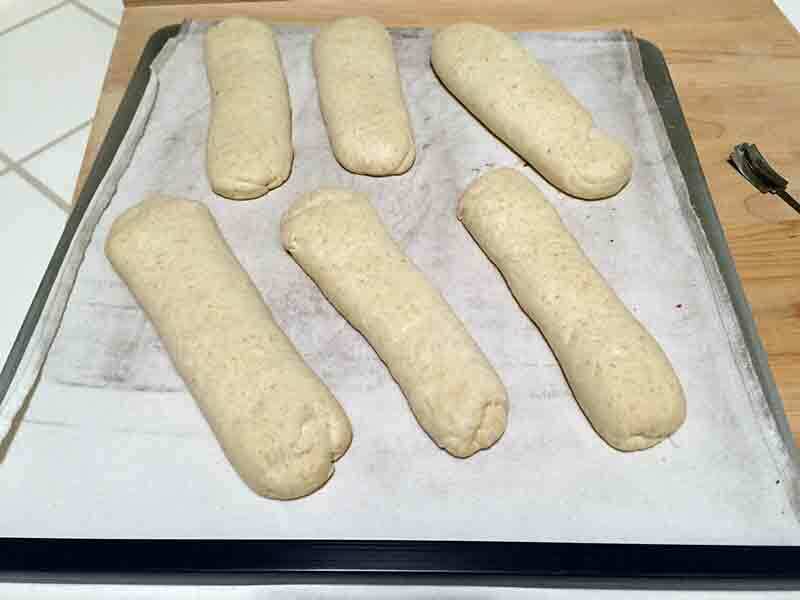 Divide the dough into 6 equal pieces and pre-shape as logs or round. Stretch each piece to a rectangle 8-12 inches long, depending on the weight of each piece. Proof for 45 minutes, covered. Transfer the loaves to your peel. Turn down the oven to 480ºF. Score the loaves, if desired, and load them onto your baking stone. Bake with steam for 10 minutes, then remove your steaming apparatus and continue to bake for another 10-12 minutes. Pre-shape as rounds, cover and let rest for 1 hour. Proof on linen or parchment, smooth side down for 45 minutes. Pre-heat oven to 500ºF with baking stone and steaming apparatus in place. Turn down oven to 460ºF. Steam oven and transfer loaves to th baking stone. After 12 minutes, remove steaming apparatus. (If you have a convection oven, turn switch to convection bake and turn the temperature down to 435ºF). Bake for 18 minutes more in a dry oven. 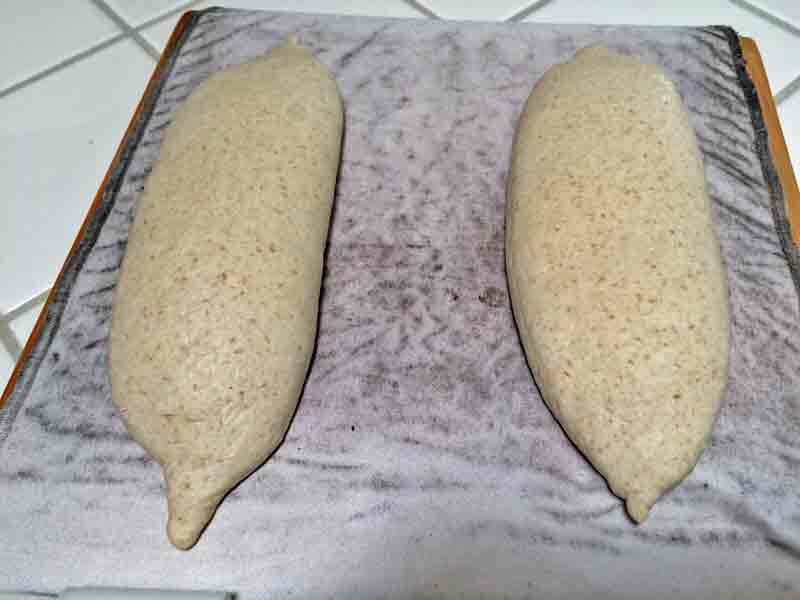 Transfer loaves to a cooling rack and let cool thoroughly before slicing. SJSD Pains Rustique - some unscored, others scored in various ways. 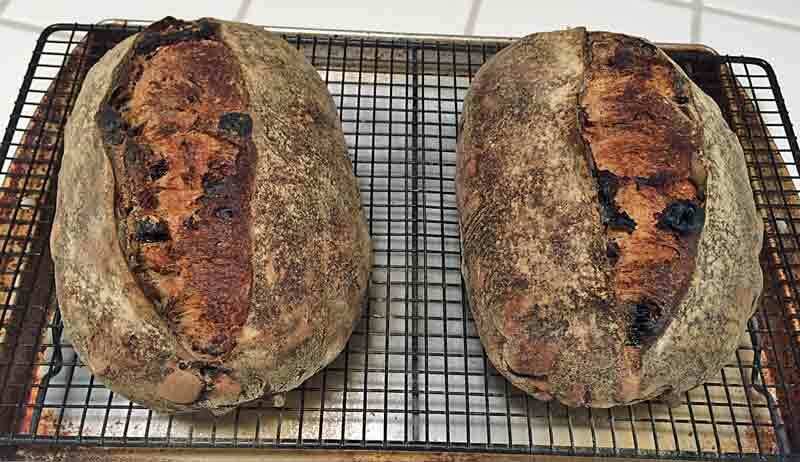 I baked two breads this week (so far). It wasn't until I was well into the process that I realized both were originally posted by Hansjoakim a few years ago. 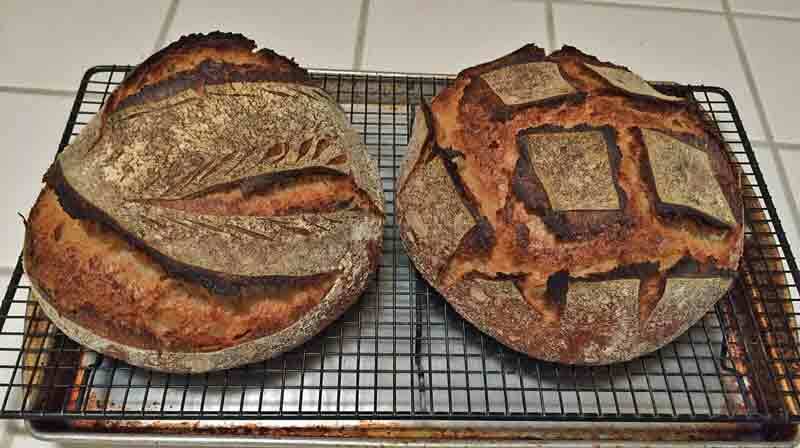 Both are leavened with rye sour. The Pain au Levain is still cooling and hasn't been sliced. Both of these breads are uncomplicated to make yet fabulously delicious. The formulas for both can be found on TFL. They are highly recommended.